A newly published study of the mummies in the crypt of the Church of the Whites in the town of Vác, northern Hungary, has found they harbored multiple strains of tuberculosis all descended from a common ancestor in the late Roman period (396-470 A.D.). Contemporary TB infections are usually caused by a single strain. The remains of 265 townspeople buried in the crypt between 1731 and 1838 were discovered in 1994 by a construction worker doing repairs on the church. 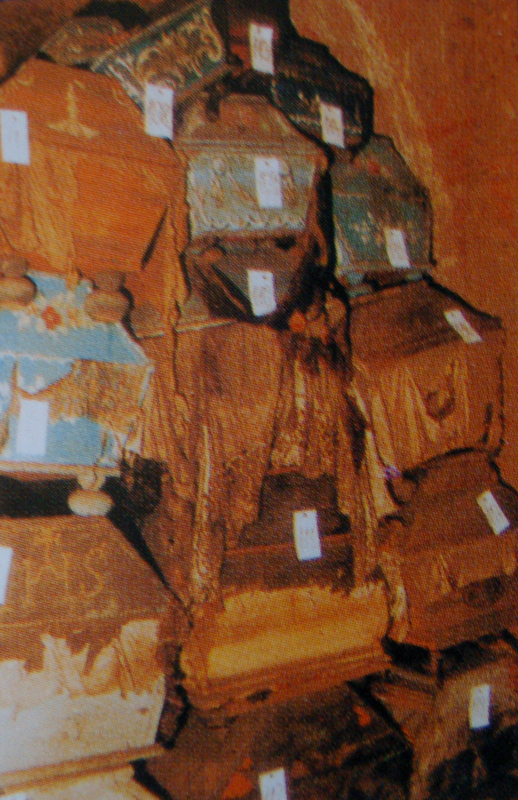 The vault had been bricked in decades before and forgotten, leaving the cool, dry air and the anti-bacterial, fluid-absorbing properties of the wood chips placed under their bodies and of their elaborately painted pine coffins to naturally mummify the bodies and preserve even their clothing in the most exceptionally pristine condition. 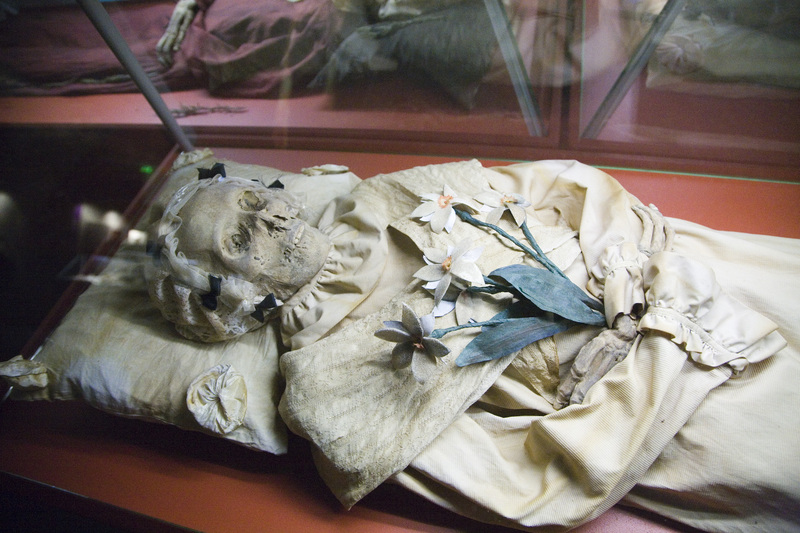 After X-rays at the Hungarian Natural History Museum in Budapest found evidence of tuberculosis in the bones, subsequent studies determined that 89% of the mummies had been infected with the tuberculosis pathogen at some point in their lives although only 35% of them were actively suffering from the disease at the time of their death. The prevalence of tuberculosis in the group, their apparent resistance to the disease and the pre-Industrial, pre-antibiotic timeline of their deaths provided researchers with a rare opportunity to study tuberculosis during its peak infection years for invaluable information about how it was spread and how people’s immune systems fought the infection. A multi-disciplinary team of researchers from the University of Warwick, the University of Birmingham, University College London, the Hebrew University in Jerusalem and the Hungarian Natural History Museum in Budapest extracted DNA from samples drawn from 26 of the Vác mummies that were known to have harbored TB pathogens. Using a methodology called shotgun metagenomics to extract tuberculosis DNA directly from the samples rather than attempting to isolate and culture the pathogen, the team was able to get results in days rather than weeks. They found 14 examples of TB DNA in eight bodies. Five of the eight bodies sampled harbored multiple M. tuberculosis genome sequences for a total of 12 different strains. One body had three different strains of tuberculosis. Mixed infections like this are rare in Europe and America today, but in areas of the world where TB is still prevalent one out of five patients have multi-strain infections. The people in this study died when TB was at peak prevalence in Europe, killing millions as the White Plague. They also discovered that the samples from two bodies known to have been mother and child — Anna Schöner (mother, died 1793) and Terézia Hausmann (daughter, 28 years old, died 1797) — shared the same two genotypes. What a complicated disease TB is. No wonder it takes half a year of intense antibiotic treatment to cure (if the strain isn’t resistant, that is). The metagenomics approach appears to be more effective at identifying multiple TB strains in samples than the microbiological culture approach. This method could prove a signficant improvement in the diagnosis of modern TB infections and opens the door to new treatment possibilities in the age of antibiotic resistance. The Warwick Medical School team has now successfully used metagenomics to identify the lineages of TB bacteria in contemporary samples. That study was published last September, but was actually performed after the pathogen strains were extracted from the Vác mummies, so the 18th century victims of the White Plague have already helped today’s victims by giving them a much faster and more accurate method to identify the bacteria causing their illness. That’s an important step in finding more effective, targeted treatment protocols. Here, we have confirmed the remarkably high prevalence of TB within an affluent, urbanized, but largely pre-industrial, Central European population. By showing that historical strains can be accurately mapped to contemporary lineages, we have ruled out, for early modern Europe, the kind of scenario recently proposed for the Americas, that is, wholesale replacement of one major lineage by another (with a different host range and presumed pathogen biology) and have confirmed the genotypic continuity of an infection that has ravaged the heart of Europe since prehistoric times. With TB resurgent in many parts of the world, including Hungary, the struggle to control this ancient infection is far from over. This entry was posted on Thursday, April 9th, 2015 at 11:56 AM	and is filed under Modern(ish). You can follow any responses to this entry through the RSS 2.0 feed. You can skip to the end and leave a response. Pinging is currently not allowed. Fascinating. How in the world do you manage to come up with such interesting stories with historical connections? I went on to read the Nature article. This not only gives yet another view into the lives of people of the time, but the approach used may contribute to understanding other diseases of the past and contribute to managing and treating them today. Two which come to mindare borrealosis and babesiosis, tick-borne diseases which have in recent decades rapidly spread geographically and morphed physiologically into multiple strains. Both are difficult to identify in the lab. Some of the techniques pioneered in the TB study may contribute to better diagnostic methods as well as understanding how they spread and change as they move from host to host. I was hoping you’d comment, Annie, because you’re so knowledgeable on these issues. I hadn’t even heard of borrealosis and babesiosis before you mentioned them. The possibilities are infinite.